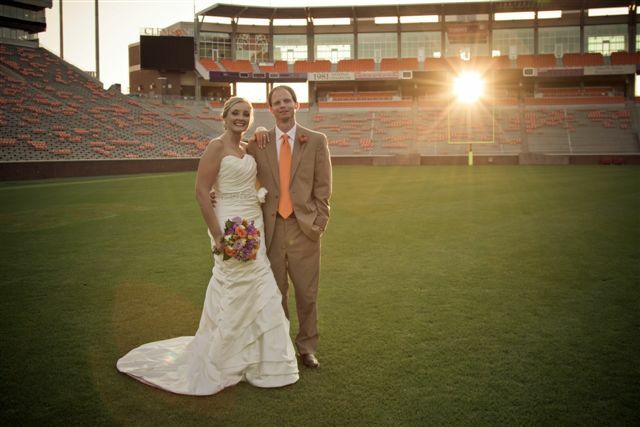 Today we are fortunate to share with you the love story of Clemson alum Scott and Clemson Girl Kristin. The two were married in the Carillon Garden in October 2012, and the reception was in the Hendrix Center. Their wedding photos show you just how beautiful a wedding can be when it's on the most beautiful campus - Clemson. 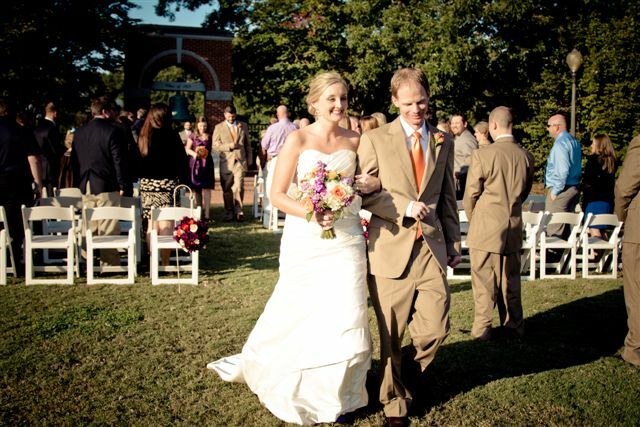 Scott and Kristin first met at Sardi’s Den in Clemson. Scott was out to eat with his college roommate Jason, and his roommate's girlfriend Lori. Kristin happened to be at Sardi's at the same time. Lori is Kristin's hairdresser, so Kristin stopped and spoke to her at the restaurant. Lori was doing Kristin's hair the following week, and when Kristin got to the appointment, Lori started asking Kristin questions about if she was dating anyone. Lori then asked Kristin if she would be willing to go on a double date with Scott. Kristin said yes, and they all went out that Saturday evening back to Sardi’s Den. That was in December 2010, and they’ve been together ever since. "We celebrated Valentine’s Day on Feb 18th, 2012. We had reservations at Larkin’s in Greenville. Before we left my house, Scott got down on one knee and proposed. He told me that he had planned on us going for a walk downtown and proposing, but it was supposed to rain. It was so sweet because you could tell that he had his mind made up on that day and was disappointed that it wasn’t as he originally planned. It was still special to me, and I am glad that he proposed in the house we now all live in together. It’s now our house." Kristin and Scott are big Clemson fans, and Scott is really into Clemson sports. Kristin has a son, Riley, who is 7. He is a huge Clemson fan according to Kristin. 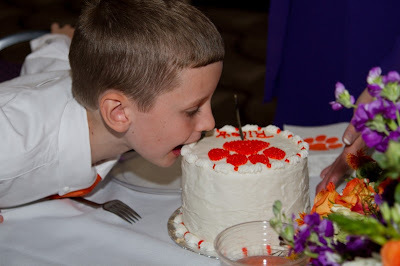 He decorates everything he can with Clemson paws and has a bright orange bedroom at his Dad's house. 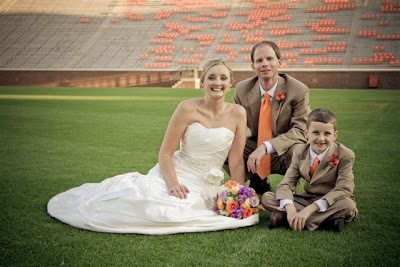 Kristin, Scott and Riley live in Easley, so they go to Clemson to eat every few weeks. They love being so close to Clemson. 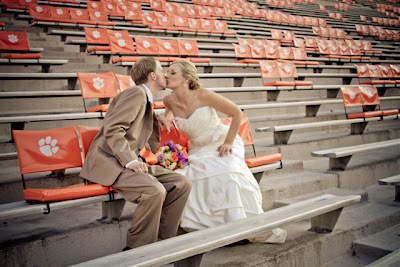 Kristin and Scott had lots of Clemson touches on their big day - not to mention the wedding was in Clemson! The day the 2012 Clemson football schedule was released, the couple realized that the bye week would work perfectly for the timing of their wedding plans. They immediately contacted campus events about booking the bye week date. 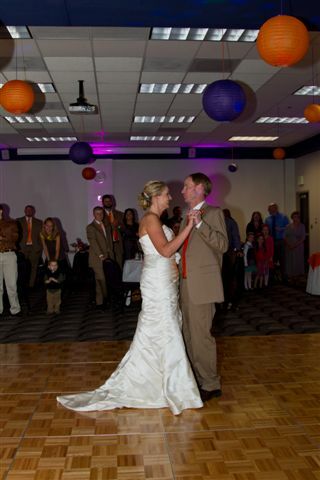 TigerPaw Productions was great on setting up and handling the wedding and the reception. They even helped the couple pack up their car after the reception. The wedding colors were orange and purple, of course! The ceremony was on campus at the Carillon Garden, and they had the reception at the Hendrix Center. 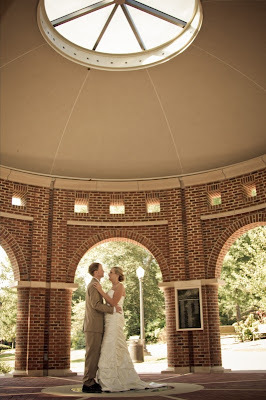 Kristin and Scott did their “first look” at the Rotunda. 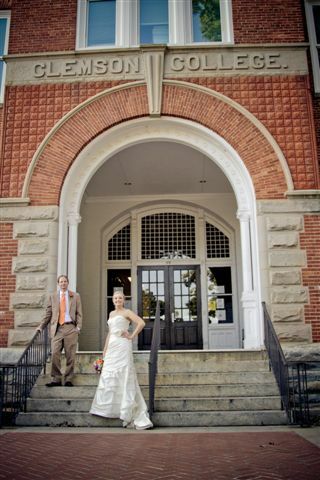 They stayed at the inn on campus for the first night before the honeymoon. 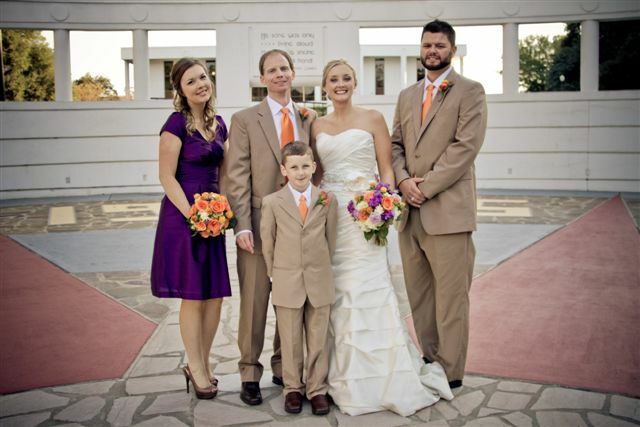 Kristin had her bridal pictures taken on the golf course, and the couple had a photo shoot in between the wedding ceremony and the reception in Death Valley. 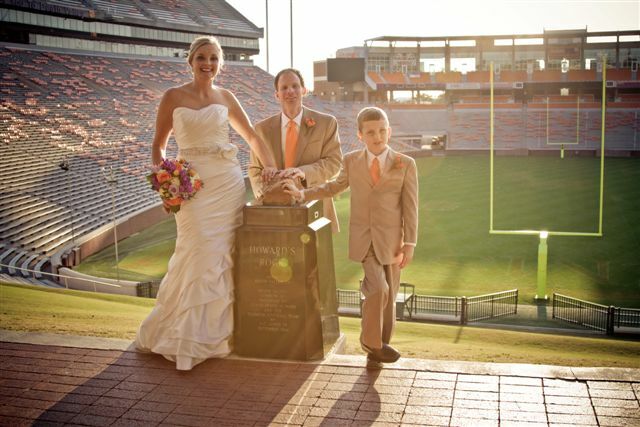 They posed with Howard’s Rock and ran down the hill in their wedding attire. The wedding cake was orange and white, and the reception included orange and purple paper lantern decorations and white and orange linens. 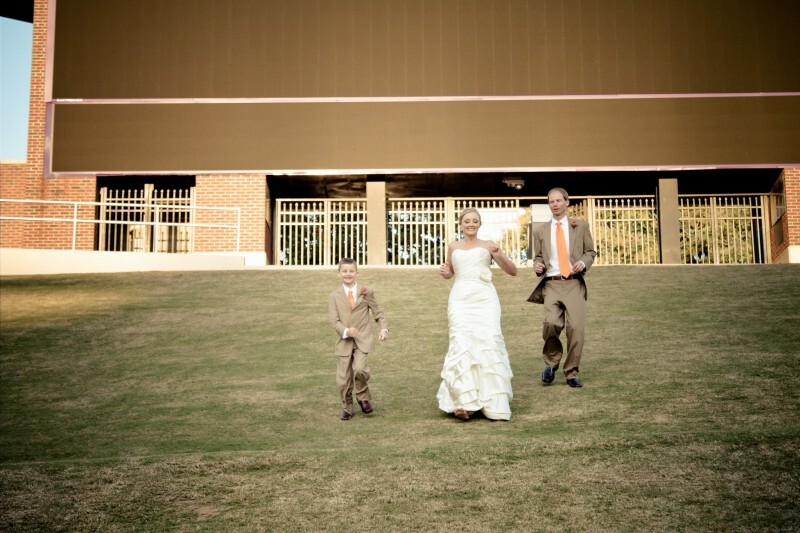 The couple wanted to include Kristin's son Riley in the wedding as much as possible so it would be just as special for him. 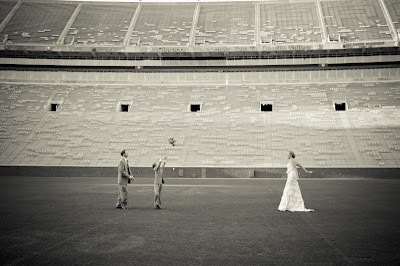 They included him in their engagement photos, and during the ceremony, he walked Kristin down the aisle and stood up front with the couple. They told their minister that the ceremony had to be as short as possible, or else they would lose Riley's attention span. Riley proceeded to stand in the front of the guests and smash acorns with his feet during the ceremony, much to the entertainment of the guests. 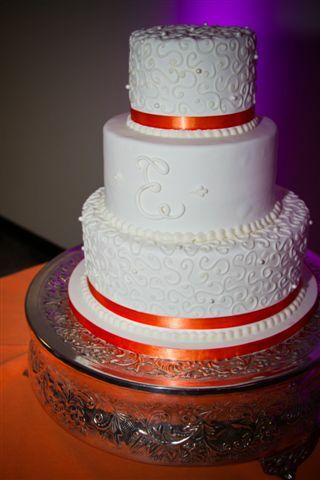 The couple also had a special Clemson cake with Riley's name on it at the reception as a surprise. 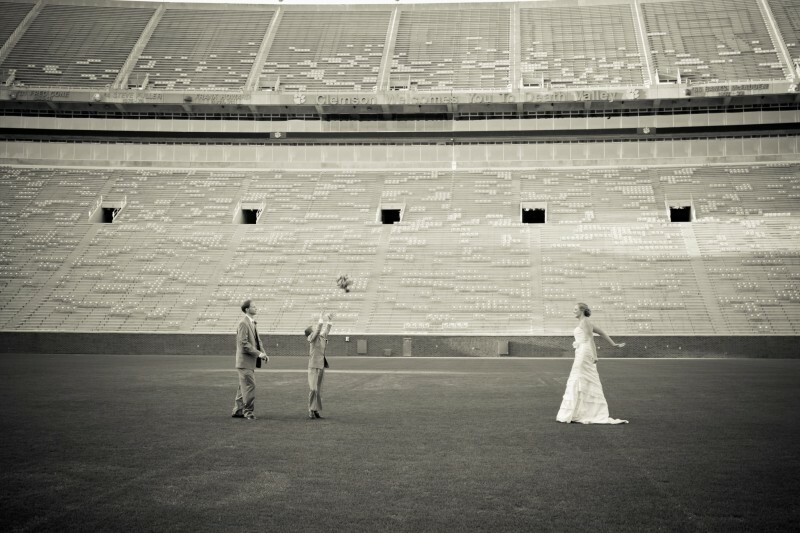 "Check out the campus for having your wedding. 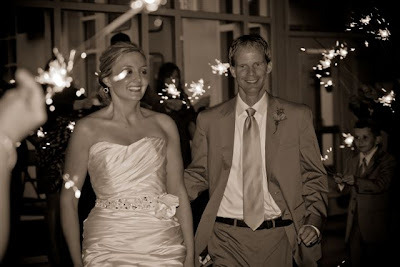 It’s quite affordable when you start pricing out all of your wedding costs. Everyone in Clemson is so great to work with! Also, use Wedding Wire to help choose vendors. The reviews are very helpful. 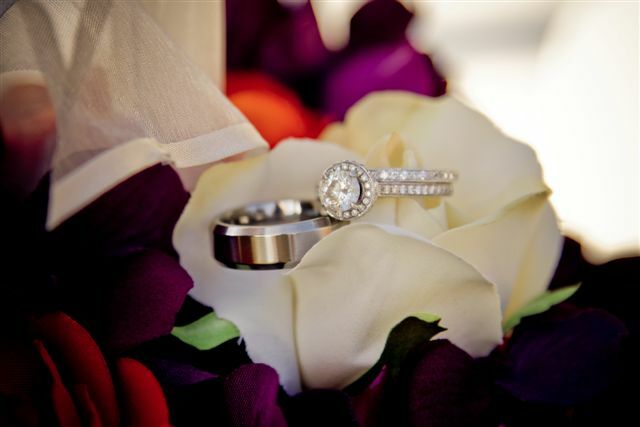 Try not to stress and enjoy the wedding planning." Kristin and Scott's amazing Clemson wedding photos were taken by the talented Alyssa and Ryan Nichols of Jac Photography. 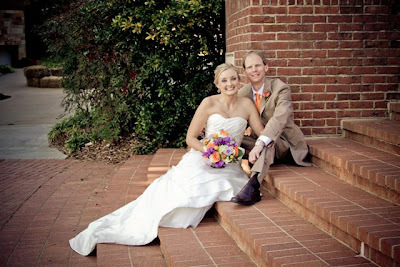 Thanks to this sweet couple, Kristin and Scott, for sharing their amazing photos and sweet love story with us today. 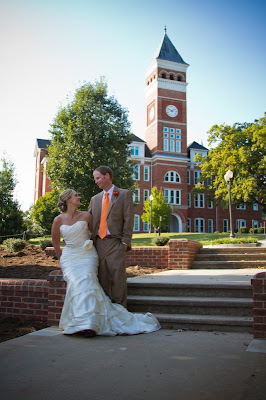 Do you have Clemson engagement photos you would like to share in an upcoming Wedding Wednesday post? Did you feature Clemson-esque decorations or traditions at your wedding? Email us at clemsongirlblog@gmail.com and let us know!